To face-off against Thanos as evenly as possible, characters we love are broken up into different teams and locations, each acting as a piece of the puzzle to defeat him: Thor with Rocket Raccoon and Groot embark to retrieve a powerful weapon to defeat Thanos. The rest of the Guardians try to protect Gamora's precious secret about the Soul Stone. Iron Man and Spider-Man attempt to rescue Doctor Strange who is in possession of the Time Stone and captured by Thanos's henchman. With the Mind Stone implanted into Vision, the Avengers on Earth - Black Panther and fellow Wakandans, Captain America (Nomad), Scarlett Witch, The Hulk, Falcon - try their best to defend him and stay ahead of Thanos's inevitable invasion. With so many characters sharing the screen, it was my first impression that 160 minutes would not be enough; that the story would be disorganized and boring. 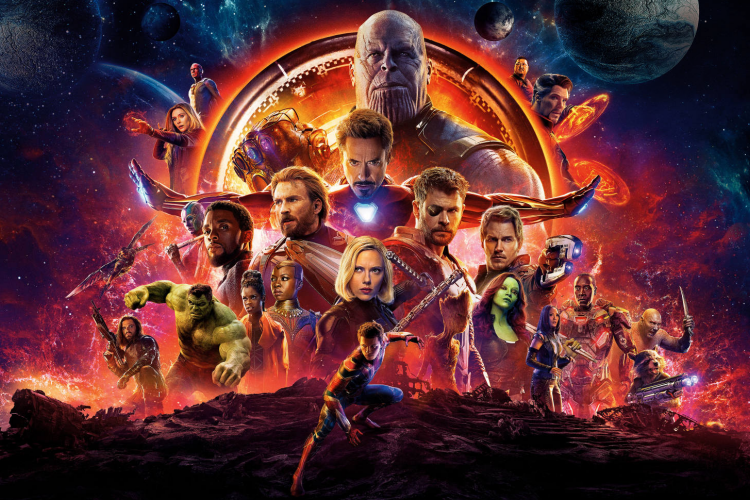 However, The Russo Brothers serving as directors go all out in this film to create a showdown between good versus evil that's well-paced, intense, action-packed, and emotional. Leaving origin stories, family squabbles, heists, and political disagreements behind, the nineteeth movie is all about the ensemble in one big space opera showdown. Time truly flies by as familiar faces and conflicting personalities play catch-up with each other and try to save the rest of the worlds from extinction. That said, at times the plot is consistently re-purposed to keep it going for the whole running time. It's not that there isn't enough story to go around, nor does the script contain massive plotholes, but the transitioning between the groups isn't the smoothest. Sequences, either action or character-based are sandwiched together, which means your favorite might not be too essential to the plot. I loved 'visiting' the different groups, however, Black Panther and Wakanda with Captain America's crew versus the Black Order and Thanos' army was my favorite. As much as they are on-screen, it didn't feel like it was enough. But splitting screentime between so many castmates gives others the chance to shine - the newer Avengers take a bigger step into a larger world with the originals, Wanda and Vision's relationship is an emotional driving force for the Earth storyline, and Gamora's backstory with Thanos adds a whole new layer to the villain's arc. Given that newer characters are being introduced to the first time with veterans, the cast comes together seamlessly like a big family reunion. Additionally, to ease the rat race to guard the Stones, the first hour or so builds on humor. Though superhero/action flicks can, of course, be funny, at times the script packs in so many one-liners, you can feel the meme-worthy catchphrases going viral then and there. Sometimes this works where it fits the character - Tony's sarcasm covering up his guilt or fears, Spider-Man's inexperience as an Avenger, the Guardians as one big dysfunctional family, etc. At other times, those laugh-out-loud moments awkwardly pump the brakes on what's going on around them. In particular, Thor's origin films Thor, The Avengers, and Thor: The Dark World played to the truthfulness of the Space Viking being thrown out of his element on Earth and Asgard. Chris Hemsworth has some spectacular moments in this movie, and has created an amusing and heartfelt sibling rivalry with Tom Hiddleston's Loki. But Infinity War carried on Thor: Raganrok's style of making them caricatures of their glory days, where everything they do is supposed to show how odd or weird they look and act between everyone else. Also, despite Mark Ruffalo's innate charisma, Bruce Banner as the conflicted scientist who's inwardly fighting The Other Guy has lost all intrigue and sadly became the bumbling fool who just doesn't know when to turn green and big or not. While the Marvel Universe is full of fish-out-of-water personalities in typically lighthearted adventures, the latest installments are more focused on dragging out jokes that stifle the heartfelt moments when there should be a time and place to make the audience laugh, and it's not every other minute. Infinity War is so massive, there's a lot to take away without spoiling too much. From relationships being tested, making new friendships, and trying to survive Thanos's destruction, the story weaves the characters' journeys together into a rollercoaster. The stakes are set at the very beginning, packs in the middle with fun and excitement, and builds to an ending that is shocking and dark. However, the movie isn't radically different than Marvel's previous films. After nineteen movies Walt Disney Studios have created a formula of comedy, action, and drama that works, so the movie's combination of everything we've seen before but on a gigantic scale; a surprise cameos and twists to heartbreaking sacrifices prove they might have a few tricks up their sleeve. With Marvel knocking superhero flicks out of the park left and right, Infinity War had a lot to live up to. From the get-go, with fans avoiding spoilers like the plague, the cast not being able to read the full script, and the poster which could barely fit all of the cast's name on it, this movie screamed hype, movie of the year, blockbuster of the summer. After all the buzz is said and done with, the nineteenth film in the MCU, Infinity War throws the gauntlet down basically against itself. Let's hope the sequel knows what its up against.